Everyone is familiar with IKEA, the Swedish flat box furniture giant. Therefore, it should come as no surprise to find out that IKEA has a number of different mattresses on offer. This review will give an overview of the different options they have, and look at a few of their more popular products in depth. Should I Buy the Morgedal? Should I Buy the Hasvag? IKEA has 15 mattresses on sale as of this writing. 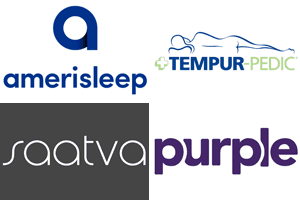 The mattresses all come in a range of sizes and can all be purchased online or in person at an IKEA store. There are two main categories for IKEA mattresses. While there is plenty of variation in those categories, IKEA can broadly be understood to produce foam mattresses and innerspring mattresses. Their foam mattresses are all on the firmer end of the spectrum, and their innerspring or coil mattresses are softer than the foam ones. The different categories are all available at a wide variety of price points, which means that it’s likely you’ll be able to find a mattress that fits your budget, no matter what that budget is. IKEA’s foam mattresses are made from poly foam, memory foam, or latex. The thinnest foam mattress is 3.8” and the thickest is 9.5”. The coil mattresses have a height that ranges from 5.8” to 17.8”. The coil mattresses also all have at least one layer of foam on top of the coils, and that foam can me poly foam or memory foam. One of the most important similarities that all of the IKEA mattresses share is that they are universally on the firmer end of the firmness scale. On a scale of 1-10, with 1 being the least firm and 10 being the most firm, the softest mattresses that IKEA offers comes in at a 5.5. The majority of them are in the 6-8 range, with some going up to a 9.5. This is important because most people in America prefer a medium firmness for their mattresses, so if you’re one of those people then you may want to think twice about getting a mattress from IKEA because it is almost certain to be extremely firm. The Morgedal is an all foam mattress that comes in different levels of firmness. It is available online and at their brick and mortar locations. The Morgedal is 7.125” high and is constructed from two layers of foam. Top – the top layer is designed for comfort and support. 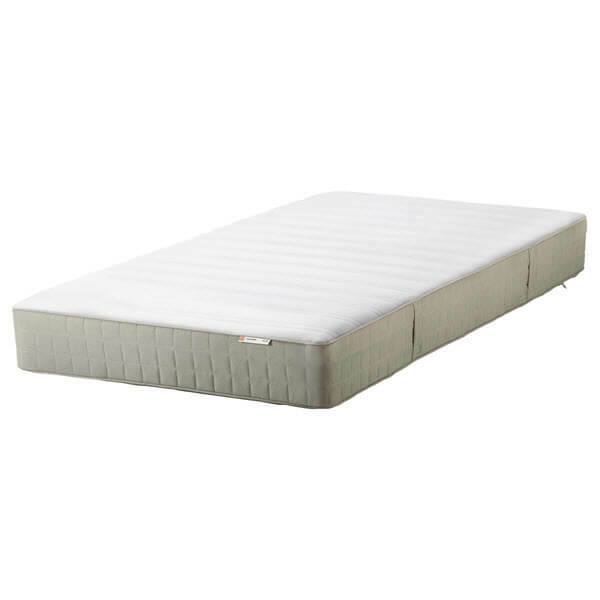 It is made from 3.75” of polyurethane foam and is the primary source of comfort on the mattress. Bottom – the bottom layer acts as the foundation for the mattress, and is intended to provide the bulk of the support. It is constructed from 2.5” of base foam. You’ll notice that the Morgedal is only made from two layers of foam, not the usual three or more that we usually see in today’s modern foam mattresses. This helps contribute to the firmness that we noted earlier. The cover of the Morgedal mattress is made from cotton and polyester in a 36/64 blend. 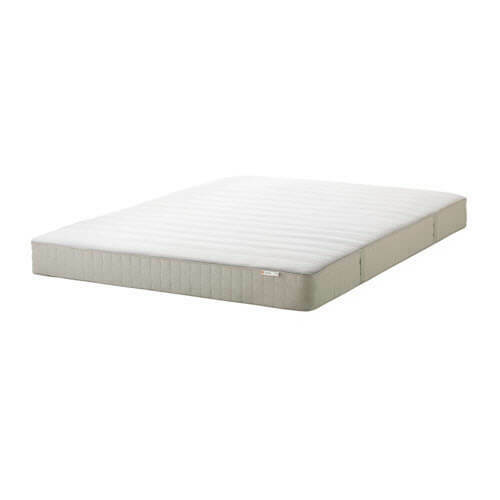 It is designed to be thin, lightweight, and to contribute to the breathability of the mattress. As a further result, the sleepers will be lying almost directly on the foam, with very little material in between them and the mattress. The thin nature and highly breathable design also helps the mattress stay cool while in use. The cover on this mattress looks similar to the covers on most modern foam mattresses. It has a white top and gray side panels. One thing we liked about the Morgedal that we didn’t see on many other, non-IKEA mattresses was the fact that it has handles attached to the side of the mattress to help the ease of moving it as well as to give some leverage when you are picking it up to put fitted sheets on. This isn’t necessary but it is a nice touch. The Morgedal mattress has two different options for firmness. The medium-firm variant rates at an 8 on the firmness scale, and the firm version is a 9.5. These numbers are quite high for most American mattresses, and we suspect that they’re a bit high for most American sleepers. That being said, if you prefer or require a firm mattress to help with pressure points, then the Morgedal is one of the firmest around. Additionally, the mattress itself lacks personality, and has a bit of a dead feel to it. This could be from several things, but we suspect that it is the lack of sufficient thickness combined with the type of foam that is used to support the top layer. Moreover, heavier sleepers should also be careful with this mattress because the thickness (or thinness) means that it can’t provide the deep compression support that heavier sleepers need. On the upside, the firmness of the mattress means that it has a very fast response time, with the poly foam layer being very responsive. There’s also more bounce to this mattress than most of the other foam mattresses on the market. However, the downside of that is a greater degree of motion transfer. Another area where the Morgedal does well is cooling, thanks to the thinness of its cover and the overall design. Despite the thinness of this mattress, we didn’t encounter much sinkage with it. Standing in the middle only produced about 3.5” of sinkage, and laying on the back produced 1” of sinkage. This is much less than most other foam mattresses. It’s important to note that these figures we reached using a test subject who weighs ~140lbs, and so your results might be different. There’s a very narrow range of sleepers who will truly enjoy the Morgedal. It’s best for people who like a very firm feel with minimal sinkage, creating the impression that you’re floating on the mattress. The next mattress we’ll look at is the Hasvag. This is one of Ikea’s coil mattresses, and it also has a layer of foam on the top for added comfort. 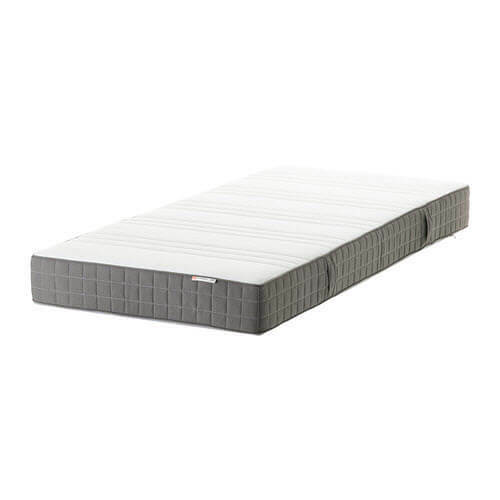 Top – the top layer is made from 1.25” of poly foam and works to assure the comfort of the sleep experience, along with providing relief from pressure points. Bottom – The bottom layer of the Hasvag consists of 5.5” of steel coils. They provide most of the support and contour you experience with this mattress. A queen mattress has 375 coils which facilitate and enhance bounce and airflow. Edge Layer – the final layer of this mattress is a 5” layer of poly foam that runs along the corners. It works to help re-enforce the corner edges while providing more edge support than the mattress would have otherwise. The Hasvag cover is a mix of cotton and polyester in a 43/53 blend. This results in a soft, cool feel because of the excellent breathability of those materials. The cover is designed to enhance and facilitate airflow. The look of the cover is very standard, with a white top and gray side panels. Like the Morgedal, it has handles to make transport easier. On the 1-10 firmness scale, the Hasvag comes in at a 6.5. This makes it one of the softer mattresses offered by IKEA, but it is still more firm that some people would want. It’s one of the most popular coil mattresses that IKEA makes. The coils enhance the bounce of the mattress, almost to the point where there’s too much, as the motion transfer we experienced for this particular mattress was well above average. Moreover, the thinness of the mattress combined with the coils can create uncomfortable pressure points. The coils don’t do a great job of offering support, and sleepers of all positions have reported aches and pains upon waking up in this bed. While the Hasvag offers more support than the Morgedal, heavier sleepers will still want to be sure this is the mattress for them before buying. 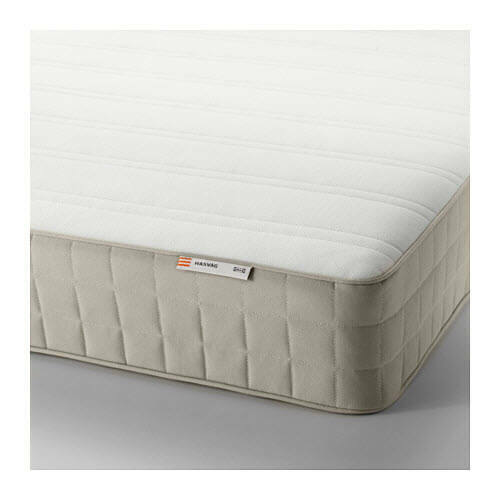 The coils and foam are set up in a way that heavier sleepers will likely experience a greater number of and intensity of pressure points from this mattress. The Hasvag does perform very well when it comes to sinkage. Standing in the middle of the mattress produced 3.75” of sinkage, and laying on the back on the mattress in a normal sleeping position created 1.5” of sinkage. On the whole, that’s much less than most foam mattresses, and better than many of the coil mattresses we’ve looked at. As you can see, the Hasvag isn’t offered in King size, so make sure you know how big your bed is when considering this mattress. IKEA mattresses are good for what they are, but they’re not as good as many of their competitors. If you’re considering an IKEA mattress make sure it’s because the price is right, not because you’re expecting a soft or comfortable sleep.